Understanding Water Hammer: Causes and most effective solutions for Water Hammer in fluid flow systems and industrial applications. DFT Inc's engineers have been working with professionals in a range of industries for decades, helping to identify and resolve the underlying causes of water hammer. In this eBook you will learn about many of these common causes, how they impact your system and some of the basic changes you can make to eliminate them. What causes water hammer and why it is such a persistent problem. The role design plays in reducing the risk water hammer poses to your system. 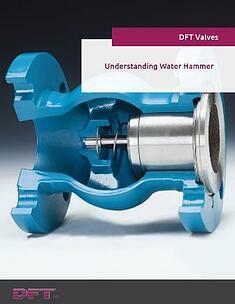 DFT's professional recommendations for coping with water hammer.